Today I'd like to offer two short book reviews of texts I've recently read that I enjoyed very much. They are extremely different books, but both valuable I think in their own ways. 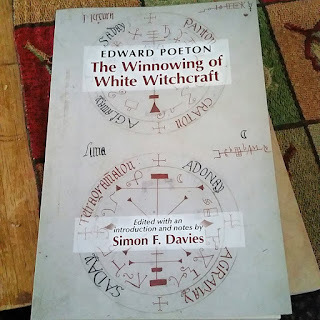 The first book I'd like to review today is 'The Winnowing of White Witchcraft' by Edward Poeton, with an introduction by Simon Davies. The book is a new release of a 17th century book that had never been published. It was written as an anti-witchcraft treatise in the 1630's (exact date unknown) but is aimed less at what we might expect [read: diabolism] and more at cunningfolk and similar folk practices in England. The author was a physician and had strong opinions about the healing practices of cunningfolk which he criticized through this treatise and by trying to equate cunningfolk directly to more diabolical witches. The text is set up as a dialogue between a cleric, doctor, and uneducated country man; the country man frequents cunningfolk and the other two are set in the text to persuade him to stop by convincing him such folk are just as bad as actual witches. Although an argument against cunningfolk it provides a good amount of information about what such people were doing at the time, as well as giving a descriptive 14 point list of what activities a witch, specifically a white witch or cunningperson, could be identified by which included being observant of "good and bad dayes, and of lucky and unlucky howers"; identifying and aiding bewitched people; divining with personal objects [psychometry]; use of spells and charms that they term prayers; and reliance on omens. It also mentions a person having a familiar spirit which they first called an angel of God then admitted was a fairy. There are small bits of folk magic practices throughout the work. 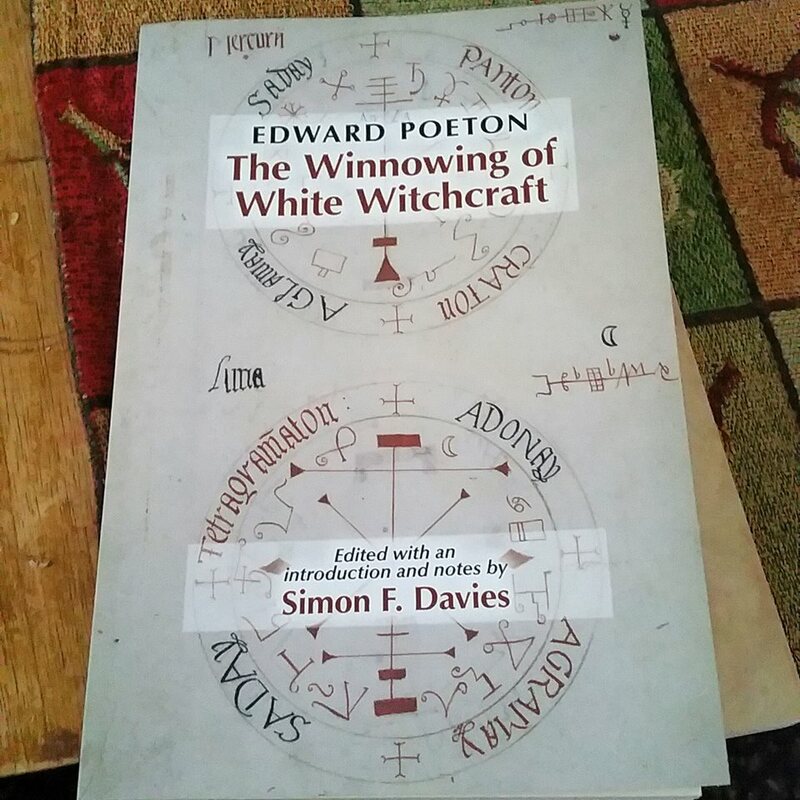 The text is heavily footnoted and annotated throughout and includes a wealth of valuable material for a person studying early modern witchcraft or cunningcraft. If this subject interests you then I'd say it's a good read with some interesting information in it, particularly as it is an original 17th century source. It was published by the Arizona Center for Medieval and Renaissance Studies and it is very well done, with an exceptional introduction and footnotes throughout. The introduction does a wonderful job of setting the cultural tone that the text was written in and establishing who the author was, both essential points. I will however add two caveats: at $45 it is very expensive for a 77 page book and you do need a working ability to read early modern dialects, particularly those meant to be intentionally archaic and rustic. Another review I had seen of this book (which actually motivated me to find a copy) gave the impression the third speaker in the text was nearly unintelligible and while I did not find this to be so other readers may have more difficulty with his sections. A small example to illustrate: "Cham zorry master doctor, that you shud ha zuch a conzete o mee: I tell ee truely (I thong God vort) I dee ze my prayers ery morning, whan I wash my vace an honns, An zo agen at night whan cham abed..."
The second book I'd like to review if 'British Fairies' by John Kruse. I had recently become aware of a blog 'British Fairies' and then found out that the blog's author John Kruse had a book of his collected material under the same title, so I decided to seek out a copy. The book is divided into three parts; the first part further into three subsections. Overall there are 35 chapters and they are all fairly short and set up much as a blog article would be. This style lends itself to easier reading, which is good because the author has a more cerebral tone and approach to the subject that some readers may prefer in smaller doses. The first part is titled "the Character and Nature of British Fairies" with subsections on basic characteristics, attributes, and human relations. 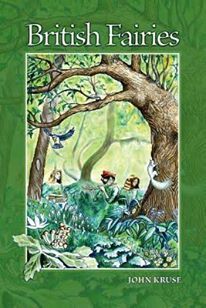 The second part looks at fairies in art and literature; the third focuses on "themes and theories" relating to fairies. The book is 186 pages and is well research and thoroughly cited and footnoted throughout. This is a book that is going on my list of 'must reads' for fairylore. It is well written and thorough, and takes a much needed deeper look at specifically British fairylore focusing on primarily England, Cornwall, and Wales. The author touches on all of the vital areas one would hope to see in such a text, from questions about whether fairies have physical forms to how they came to be viewed as tiny childlike girls with wings. The chapters are really more like short essays on particular subjects, perhaps betraying its origins as a blog, and often include bullet point lists summarizing key points but this works to the book's advantage rather than detracting from it. One may choose to read the whole book through, read short sections at a time, or use the text as a reference for specific topics. The text retains a loose air of skepticism, never committing to belief or stating disbelief, however it does approach fairies through the lens of traditional folklore while tracing the shift into a very different modern understanding of who and what fairies are. The overall tone is one of exploration and seeking answers. I do not, of course, agree with everything the author believes but the material is well written and the arguments presented are persuasive and supported. There's a wealth of material in these collected essays and the format makes that material accessible while covering a lot of ground. I would highly recommend this to anyone interested in the subject, particularly if your focus is more on England, Wales, or Cornwall. What Is a Fairy Court?